Pink Star (Diamond), the most valuable cut diamond ever offered at auction is displayed by a model at Sotheby’s auction rooms in London, Monday, March 20, 2017. It is the largest internally flawless fancy vivid pink diamond ever graded by the GIA. The diamond estimated in excess of 60 million US Dollars will go for auction in Hong Kong on April 4. The Pink Star was cut from a 132.5-carat rough diamond mined by De Beers in Africa in 1999. It took two years of meticulous cutting and polishing to hone it into its current oval shape. The current record price for a pink diamond sold at auction is the $46.2 million achieved by the 24.78-carat Graff Pink, which sold at Sotheby’s Geneva in 2010. The Pink Star is more than twice as big as the Graff Pink, and its colour rating, ‘Fancy Vivid’, is the highest possible grade on the scale used to assess coloured diamonds, and therefore considered the most valuable. The pink diamond is also rated as Internally Flawless, meaning it has no internal inclusions, and is a Type IIa stone, the coveted classification given to less than two per cent of all gem-quality diamonds, which signifies chemical purity. 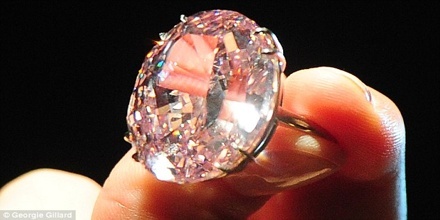 The Pink Star will be worth over $1 million per carat. That isn’t enough to break the price-per-carat record currently held by the Blue Moon of Josephine, a 12.03-carat Fancy Vivid blue diamond which sold at Sotheby’s Geneva in November 2015 for $48 million: a price of over $4 million per carat. The Pink Star diamond is the largest internally flawless fancy vivid pink diamond ever graded by the Gemological Institute of America. The oval mixed cut rock has been sized at a huge 59.6 carats, making it twice the size of the current holder of the auction record for pink diamonds. 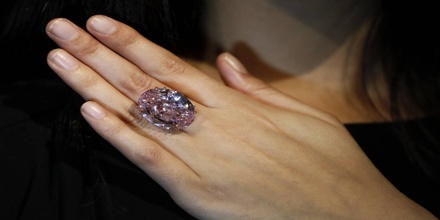 In 2010 the 24.78 Graff Pink diamond was sold for £29 million. 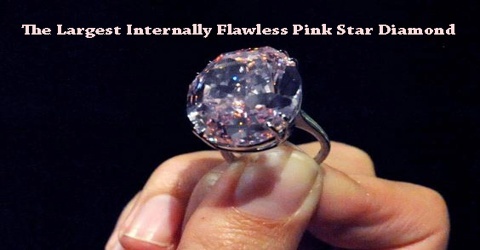 The Pink Star was originally a 132.5-carat rough diamond when it was mined in Africa by De Beers in 1999. Experts spent two years carefully cutting and polishing the stone, transforming it into today’s stunning rock. The Pink Star was displayed (as the Steinmetz Pink) as part of the Smithsonian’s “The Splendor of Diamonds” exhibit, alongside the De Beers Millennium Star, the world’s second largest (the Cullinan I The Star of Africa is the largest) top colour diamond internally and externally flawless pear-shaped diamond at 203.04 carat (40.608 g), the Heart of Eternity Diamond, a 27.64 carat (5.582 g) heart-cut blue diamond and the Moussaieff Red Diamond, the world’s largest known Fancy Red diamond at 5.11 carat (1.022 g). 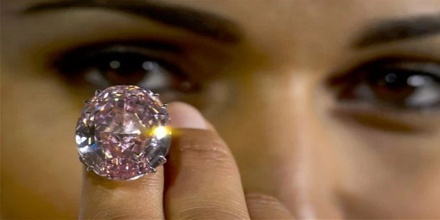 The Pink Star is expected to fetch “in excess of £48 million” easily making it the priciest diamond ever to go under the hammer. The extraordinary size of this 59.60-carat diamond, paired with its richness of colour, surpasses any known pink diamond recorded in history. 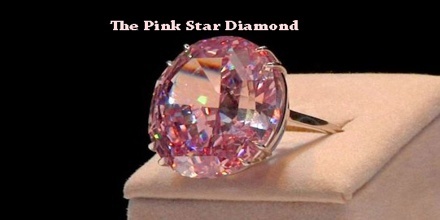 The Pink Star was originally a 132.5-carat rough diamond when it was mined in Africa by De Beers in 1999. This is not the first time this extraordinary stone his going to auction, in 2013 it was sold for £52 million at Sotheby’s in Geneva but the buyer defaulted and the rock was returned. Sotheby’s also holds the current world auction record for the most valuable Fancy Vivid pink diamond – the 15.38-carat pear-shaped Unique Pink diamond, which sold for $31.5 million in Geneva in May 2016; and the world records for the most valuable yellow diamond, ruby and white diamond – the 118.28-carat oval D-Flawless diamond which sold for £20 million at Sotheby’s Hong Kong in October 2013. “The extraordinary size of this 59.60-carat diamond, paired with its richness of color, surpasses any known pink diamond record in history,” said David Bennett, worldwide Chairman of Sotheby’s Jewellery Division.